Infusing a shopworn premise with honesty, and peppering the film with tender moments, director Ayan Mukherji creates an engaging enough drama that you’re happy to emotionally invest in.The casual, conversational style of dialogue makes it easy to relate to this film and its characters, even though their conflicts appear too superficial to take seriously.I’m going with three out of five for director Ayan Mukherji’s Wake Up Sid; it has its heart in the right place and it marks the breakout of a bright, shining star who has come into his own so early in his acting career. Watch it, and be awestruck by Ranbir. Actually, WAKE UP SID is a slice of life film. It’s not merely real in concept, but has also been told most realistically, so much so that you can’t help but draw parallels with your life or with someone you know. But what really makes WAKE UP SID most believable is Ranbir Kapoor, who’s mastered the craft at such a young age. This one’s a simple story that strikes a chord instantly. Strongly recommended! On the whole, WAKE UP SID is a well-made film that should strike a chord with the youth mainly. A metro-centric film, the film should attract its target audience and should also prove to be the first choice of the elite/urban audience this Friday. Wake Up Sid could have been just another spoilt-brat’s coming-of-age flick: plenty of attitude but bereft of soul. But it ends up being much, much more. And what makes it special is debutant director Ayan Mukerji’s (also the film’s writer) attention to detail, his nuanced way of looking at GenNow life.In the end, Wake Up Sid becomes a sort of template of how GenNow navigate their lives: deal with their own little rebellions, find meaning to their own definitions of independence and handle their own set of mistakes. It feels good when the two friends finally meet in driving rain under the grey skies by the sea. Refreshing and heart-warming, Wake Up Sid really puts you in the mood for love. There’s not much of a story to tell. It could be related in a five-minute music video — about a boy who takes everything; family, education, comforts for granted and a slightly elder, independent girl. What happens when the twain share the same roof?.The film, like Sid’s life chart, gathers momentum, meaning and melodrama post-interval.Wake Up Sid is as much about Aisha (Konkona Sen Sharma) as it is about Sid.The unlikely duo share a sublime, comfortable chemistry, which flowers from plausibly awkward to an endearing bonhomie to something truly special in a span of two and a half hours.Wake Up Sid has its heart in place, but it still doesn’t have much of a plot or novelty to rely upon. That’s why the dialogues could have done with a little more quirk and nifty humour. Having said that, a superlative Ranbir makes it too darn hard to notice. The pacing in the first half is very slow. Towards interval, the film gathers an emotional momentum but afterward it becomes slack again. The bigger problem is that the crisis of the characters never feels sufficiently awful or urgent.We never feel that anything is really at stake here.Wake Up Sid belongs to Ranbir. The actor is pitch perfect as the dazed and confused Sid. He manages to be infuriating, infantile and loveable in the same moment. We root for him from the minute we see his comic-book socks.Finally then, Wake Up Sid can’t match Dil Chahta Hai, which even eight years later remains Bollywood’s gold standard for coming-of-age movies. I’m going with a generous three stars and recommending Wake Up Sid with reservations. Wake Up Sid in literal terms is the coming of age story of one rich but irresponsible boy who becomes a man.The basic premise of the film might seem predictable not because you have seen that several times in films before but experienced something similar in real life. An average youth can relate to Sid since it’s a common phase most might experience in life when one has to shoulder responsibilities after a spoon-fed life. The simplicity of Ayan Mukerji’s writing is what appeals to the viewer. The screenplay is fresh and frothy and the feel-good factor is devoid of a mushy treatment.The pacing is slow but the momentum drops only in the second half where the screenplay tends to get somewhat cyclic.It’s pleasing to see Bollywood warming up to fresh talents like Ayan Mukerji and waking up to compelling narratives like Wake Up Sid . Ranbir is effortlessly charming as the lazy dude with a heart, and Konkona rises a little out of her usual grid. She reads Murakami, he skims through comics, and the twain do not look made for each other. `Wake Up Sid’ succeeds only partly in being a sweet rom com : the false starts, and the too-long period of being `just good friends’ feels real, but you wish there was more going on between the friends-who-turn-into-lovers. Sid and Aisha spark, but only towards the end of the film.The stand-out part of the film is the supporting cast. Despite the obvious passages, Mukherjee shows he has a way of adding nuance to a scene. 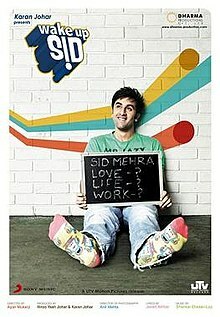 `Wake Up Sid’ is a promising first effort. This one has no middle ground. You will either love Wake Up Sid or just hate it. A section of the viewers are likely to complain about the lack of a coherent plot and its leisurely pace. But on the flip side, that’s exactly why Wake Up Sid works. When the veterans are royally messing up screenplays, Ayan Mukerji deserves full marks for his maiden effort. His conviction shows in every department. Wake Up Sid is easily the freshest film in the marquee.